Custom aprons make great gifts for potential clients and employees that love to spend time in the kitchen. Consider branded aprons when giving out free samples at stores or cooking at outdoor food festivals. With your logo displayed prominently on the front, your company will be associated with great food and fun times. Give them out at company picnics, outdoor cooking events or trade shows as a delectable gift. 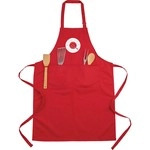 Start browsing our custom-made aprons to spice up your promotional efforts. In the kitchen or the backyard, this custom apron keeps your logo looking good. Help clients serve up their favorite meals - and a side of brand awareness - with this adorable custom apron. In the kitchen or the backyard, this butcher style custom apron keeps your logo looking good. Stay clean while being the king of the grill with this Full Color Grill Master Custom Apron. This heavy-duty apron features pockets for spatulas, tongs, seasonings, and more! Keep clean with this classic Full Color Striped Promotional Potholder! It is easy to wash and reuse. The two front pockets are helpful for keeping kitchen utensils handy. This basic Adjustable Full Length Custom Apron w/ Pockets is perfect for everday use. It provides ample storage for all of your cooking accessories! Keep clothing clean while cooking by wearing these customized aprons with your imprinted logo. Get the next big job or project done with this handy promo apron featuring many pockets for tools and more. More than a promo apron, this comprehensive kit keeps the chef's most important tools within easy reach. A naturally great promo apron for any type of food related event. Get into the spirit of the season by wearing holiday themed custom aprons with an embroidered buckle and fur trim. This promo apron features three large pockets. Made of 12 oz. denim. As far as promotions are concerned, this personalized apron has got you covered. See if customized promotional aprons are the missing ingredient in your marketing campaign! Custom embroidered aprons are the perfect gift for clients and staff in the food industry. If you know a client that loves to host barbecues, give them the the grill master apron with storage pockets and a detachable bottle opener. No grilling tool is ever out of reach. Any BBQ fanatic would more than thankful to get one. Maybe you run a restaurant, food truck or grocery store. Pass out custom printed aprons to your staff to establish a sense of team solidarity. Give them some extras to take home and show their friends and family. The more eyes on your brand the better, and this is only a taste of what you have to offer! With a suite of customization options and a wide range of sizes, colors, materials and imprint methods, you'll find the key ingredient to your next successful marketing campaign. Browse our selection and give our brand specialists a call to get started now!